Powdered coating is applied in a controlled environment within our factory. All coatings are applied over an SSPC-SP 10 near white blast and thermally cured (Oven Baked). All ASTM coatings are applied in a factory controlled environment and blast is achieved using steel grit. All Factory applied coatings eliminate weather delays and possible environmental problems. If coatings are applied to welded vessels in the field improper environmental conditions, such as temperature and humidity, can delay the project or the coatings will fail. Flash oxidation will occur in field-applied coatings if they are applied too quickly. All parts of a bolted tank are standardized which leads to consistency from one tank to another. With the standardized parts on the bolted tank, the erection time can be easily determined. Pricing is significantly more accurate. This accuracy stays the same no matter where the tank is going. Just add shipping. Bolted tanks can be dismantled, moved to another location and reassembled. The reduction of erection time leads to a reduction in costs. The coatings of a welded tank can not be applied until the tanks are welded together making completion time longer. After the tank is welded, there is a dependency on the quality of the local paint contractor assigned to the project. 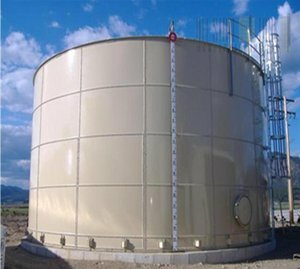 Since we erect our tanks from ground level with a jacking system, any safety risk is greatly reduced.